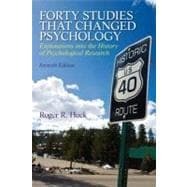 Forty studies that help shape Psychology Roger Hock's Forty Studies provides a glimpse of the science of psychology, unraveling the complexities of human nature. This book provides a more in-depth look and analyses that cannot be found by reading a textbook or research alone. It has the original studies, research & analysis about the most famous studies in psychological history. Learning Goals Upon completing this book, readers will: Gain background knowledge of the complexities in the psychology field. Learn about detailed studies in an easy, understandable manner. Understand scientific research, through closer examination of major topics. Roger R. Hock received his Ph.D. from the University of California at San Diego and is currently the Director of the Psychology Program at Mendocino College in northern California. He is the author of several well-known books including two textbooks, Human Sexuality and 40 Studies that Changed Psychology: Explorations into the History of Psychological Research. He is coauthor (with Meg Kennedy Dugan) of, It’s My Life Now: Starting over after an Abusive Relationship or Domestic Violence. He brings over 20 years of teaching experience to the project. Gazzaniga, M. S. (1967). The split brain in man. Scientific American, 217(2), 24-29. Rosenzweig, M. R., Bennett, E. L., Diamond, M. C. (1972). Brain changes in response to experience. Scientific American, 226(2), 22-29. Bouchard, T., Lykken, D., McGue, M., Segal, N., Tellegen, A. (1990). Sources of human psychological differences: The Minnesota study of twins reared apart. Science, 250, 223-229. Gibson, E.J., Walk, R. D. (1960). The "visual cliff." Scientific American, 202(4), 67-71. Fantz, R L. (1961). The origin of form perception. Scientific American, 204, 61-72. Aserinsky, E., Kleitman, N. (1953). Regularly occurring periods of eye mobility and concomitant phenomena during sleep. Science, 118, 273-274. Dement, W. (1960). The effect of dream deprivation. Science, 131, 1705-1707. Rosch, Eleanor H. (1973). Natural categories. Cognitive Psychology, 4, 328-350. Spanos, N. P. (1982). Hypnotic behavior: A cognitive, social, psychological perspective. Research Communications in Psychology, Psychiatry, and Behavior, 7, 199-213. Pavlov, I. P. (1927). Conditioned reflexes. London: Oxford University Press. Watson, J. B., Rayner, R. (1920). Conditioned emotional responses. Journal of Experimental Psychology, 3, 1-14. Skinner, B. F. (1948). Superstition in the pigeon. Journal of Experimental Psychology, 38,168-172. Bandura, A., Ross, D., Ross, S. A. (1961). Transmission of aggression through imitation of aggressive models. Journal of Abnormal and Social Psychology, 63, 575-582. Rosenthal, R., Jacobson, L. (1966). Teachers' expectancies: Determinates of pupils' IQgains. Psychological Reports, 19, 115-118. Gardner, H. (1983) Frames of mind: The theory of multiple intelligences. New York: Basic Books. Tolman, E. C. (1948). Cognitive maps in rats and men. Psychological Review, 55, 189-208. Loftus, E. F. (1975). Leading questions and the eyewitness report. Cognitive Psychology, 7, 560-572. Piaget, J. (1954). The development of object concept. In J. Piaget, The construction of reality in the child (pp. 3-96). New York: Basic Books. Kohlberg, L. (1963). The development of children's orientations toward a moral order Sequence in the development of moral thought Vita Humana, 6, 11-33. Langer, E. J., Rodin, J. (1976). The effects of choice and enhanced personal responsibility for the aged: A field experiment in an institutional setting, Journal of Personality and Social Psychology, 34,191-198. Masters, W. H., Johnson, V. E. (1966). Human sexual response Boston: Little, Brown. Ekman, P., Frieseri, W. V. (1971). Constants across cultures in the face and emotion. Journal of Personality and Social Psychology, 17, 124-129. Ross, P. (2003). Mind readers. Scientific American, 289(3), 74-77. Festinger, L., Carlsmith, J. M. (1959). Cognitive consequences of forced compliance. Journal of Abnormal and Social Psychology, 58, 203-210. Rotter, J. B. (1966). Generalized expectancies for internal versus external control of reinforcement. Psychological Monographs, 80, 1-28. Bern, S. L. (1974). The measurement of psychological androgyny. Journal of Consulting and Clinical Psychology, 42, 155-162. Friedman, M., Rosenman, R. H. (1959). Association of specific overt behavior pattern with blood and cardiovascular findings. Journal of the American Medical Association, 169, 1286-1296. Triandis, H., Bontempo, R., Villareal, M., Asai, M., Lucca, N. (1988). Individualism and collectivism: Cross-cultural perspectives on self-ingroup relationships. Journal of Personality and Social Psychology, 54, 323-338. Rosenhan, D. L. (1973). On being sane in insane places. Science, 179, 250-258. Freud, A. (1946). The ego and the mechanisms of defense. New York: International Universities Press. Seligman, M. E. P., Maier, S. F. (1967). Failure to escape traumatic shock. Journal of Experimental Psychology, 74, 1-9. Calhoun, J. B. (1962). Population density and social pathology. Scientific American, 206(3), 139-148. Smith, M. L., Glass, G. V. (1977). Meta-analysis of psychotherapy outcome studies. American Psychologist, 32, 752-760. Wolpe, J. (1961). The systematic desensitization treatment of neuroses. Journal of Nervous and Mental Diseases, 132, 180-203. Rorschach, H. (1942). Psychodiagnostics: A diagnostic test based on perception. New York: Grune & Stratton. Murray, H. A. (1938). Explorations in personality (pp. 531-545). New York: Oxford University Press. Zimbardo, P. G. (1972). The pathology of imprisonment. Society, 9(6), 4-8. Haney, C., Banks, W. C., & Zimbardo, P. G. (1973). Interpersonal dynamics in a simulated prison. International Journal of Criminology & Penology, 1, 69-97. Darley, J. M., Latané, B. (1968). Bystander intervention in emergencies: Diffusion of responsibility. Journal of Personality and Social Psychology, 8, 377-383.